FLR is on everyone’s lips. Governments all over the world have committed to restore hundreds of millions of hectares of degraded land, and the movement is just growing bigger. In 2011, the Bonn Challenge —a global effort to bring 150 M ha of degraded and deforested lands into restoration by 2020—was launched. Three years later, the original challenge target was endorsed and extended by the New York Declaration on Forests to bring an additional 200 M ha into restoration by 2030, making a total of 350 M ha, an area slightly greater than that of India or Argentina. Regional initiatives that support and contribute to the Bonn Challenge have emerged around the world. These include AFR100 (the African Forest Landscape Restoration initiative), and the Initiative 20×20 for Latin America and the Caribbean. As of September 2018, 47 countries have made Bonn Challenge commitments, pledging to restore a total of 160.2 million hectares. The six principles of Forest and Landscape Restoration (FLR). Adapted from Restoring forests and landscapes: the key to a sustainable future. Focus on landscapes: FLR takes place within and across entire landscapes, not individual sites, representing mosaics of interacting land uses and management practices under various tenure and governance systems. It is at this scale that ecological, social and economic priorities can be balanced. Engage stakeholders and support participatory governance: FLR actively engages stakeholders at different scales, including vulnerable groups, in planning and decision making regarding land-use, restoration goals and strategies, implementation methods, benefit sharing, monitoring and review processes. Restore multiple functions for multiple benefits: FLR interventions aim to restore multiple ecological, social and economic functions across a landscape and generate a range of ecosystem goods and services that benefit multiple stakeholder groups. 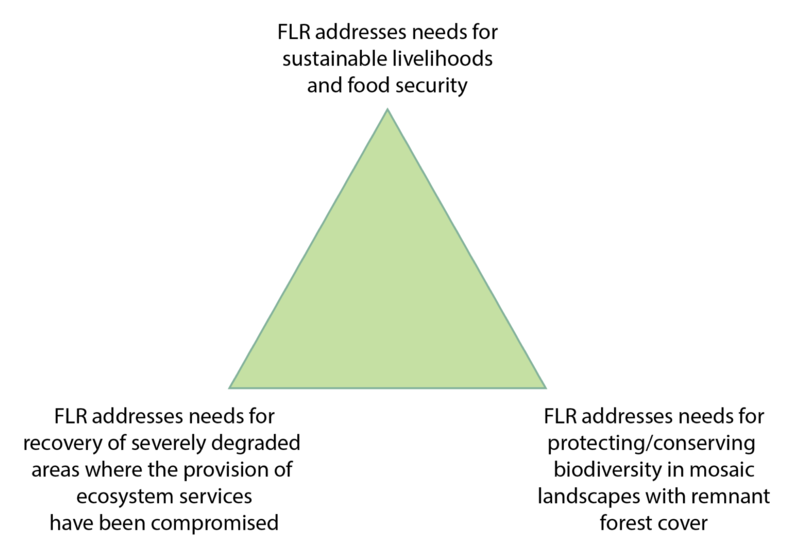 Maintain and enhance natural ecosystems within landscapes: FLR does not lead to the conversion or destruction of natural forests or other ecosystems. It enhances the conservation, recovery, and sustainable management of forests and other ecosystems. Tailor to the local context using a variety of approaches: FLR uses a variety of approaches that are adapted to the local social, cultural, economic and ecological values, needs, and landscape history. It draws on latest science and best practice, and traditional and indigenous knowledge, and applies that information in the context of local capacities and existing or new governance structures. Manage adaptively for long-term resilience: FLR seeks to enhance the resilience of the landscape and its stakeholders over the medium and long-term. Restoration approaches should enhance species and genetic diversity and be adjusted over time to reflect changes in climate and other environmental conditions, knowledge, capacities, stakeholder needs, and societal values. As restoration progresses, information from monitoring activities, research, and stakeholder guidance should be integrated into management plans. Momentum for restoration is clearly building. The quest to meet the ambitious global targets that have been set can keep this momentum up, which is great. But now that the time has come to move from commitments to action, we cannot continue focusing only on the number of hectares of land to bring into restoration. It is essential that we pay attention to the quality of restoration interventions and outcomes. This is, perhaps, one of the greatest challenges the FLR movement is now facing: how do we balance quantity and quality in FLR implementation efforts? How do we keep the momentum up while ensuring good quality restoration with outcomes that benefit both the environment and local people’s livelihoods, and that are sustainable in the long term? The Global Landscapes Forum regional conference “Forest and Landscape Restoration in Africa: Prospects and Opportunities,” took place in Nairobi on the 29th and 30th of August and gathered actors from different sectors and backgrounds to discuss success stories and challenges in relation to FLR implementation across the continent. 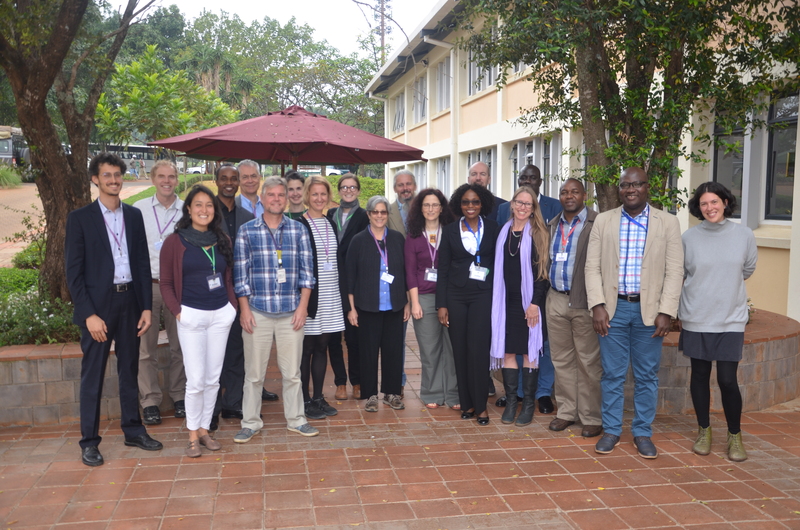 Building on the momentum of #GLFNairobi2018, WeForest, ICRAF and PARTNERS (People and Reforestation in the Tropics Network) teamed up to arrange a two-day event to discuss the need for a FLR quality framework in the African context. The event, which built on the experience gained from a previous dialogue held in Brazil in 2017 (see the brief from this meeting here), brought together scientists, decision-makers, practitioners and investors. Here are some of the key concepts that were discussed. What are the implications of deviating too much from the essence of FLR? Embodied in the principles of FLR is the adaptive management approach, an iterative process that involves the integration of design, management and monitoring to systematically test assumptions in order to adapt and learn. Adaptive management emphasizes the need to adapt to changing environmental and social contexts and to learn from doing. Thus, one may argue that, as long as an adaptive management approach is employed, it does not matter if the FLR process initially departs from the core FLR principles, as it has the potential to progressively improve over time, with guidance and support. The Bonn Challenge Barometer of Progress, a tool designed to help pledgers track their progress on restoration as part of their Bonn Challenge commitments. “These tools are useful for assessing FLR opportunities, financing, and priorities at national or subnational scales, but do not provide support for guiding implementation of FLR at the landscape scale, where local stakeholders must be empowered to lead and participate in interventions that will be sustained for generations,” highlighted Chazdon. For example, tools are needed to help guide the process to delimit the boundaries of a landscape where FLR will be initiated, and to develop a consensus vision and management plan of the landscape that effectively engages all stakeholder groups and mediates conflicts among them. The Bonn Challenge Barometer of Progress tracks how FLR commitments are being achieved, but it focuses almost exclusively on the number of hectares brought into restoration, while less attention is given to the quality of FLR outcomes. How can we make sure that FLR activities have been effective? We need evidence that restoration has worked, that it improves people’s livelihoods. However, the only socio-economic indicator included in the barometer is the number of jobs created resulting from FLR activities. Moreover, clear monitoring methodology is lacking too. ICRAF has developed a systematic biophysical monitoring framework for tracking indicators of ecosystem health over time. The Land Degradation Surveillance Framework (LDSF), has been implemented in over 40 countries over the past 15 years, hence enabling the largest field-based database on land and soil health indicators, hosted at ICRAF’s GeoScience Lab (GSL). Currently, the LDSF has been used to prioritize restoration in rangelands in Kenya and agricultural mosaic landscapes in East Africa, among other applications in South Africa and Tanzania. Who could a FLR operational framework benefit? An FLR operational framework could benefit a wide range of actors including implementers, investors, governments and private enterprise. One recent study argues that a framework could also help to market products from FLR landscapes, benefitting private enterprise and helping promote the upscaling of FLR. For NGOs and other organizations involved in implementing FLR on the ground, operationalizing the FLR principles could be used to guide action to achieve the holistic FLR goals. “From our perspective, FLR principles are very useful but not when it comes to implementation. As an implementer I don’t really know if I am doing FLR or not. It would be very convenient to link the existing FLR principles to operational criteria which are, in turn, linked to a set of indicators that can be used to monitor and evaluate FLR outcomes,” said Gutierrez. Do we need a “perfect plan” for FLR? 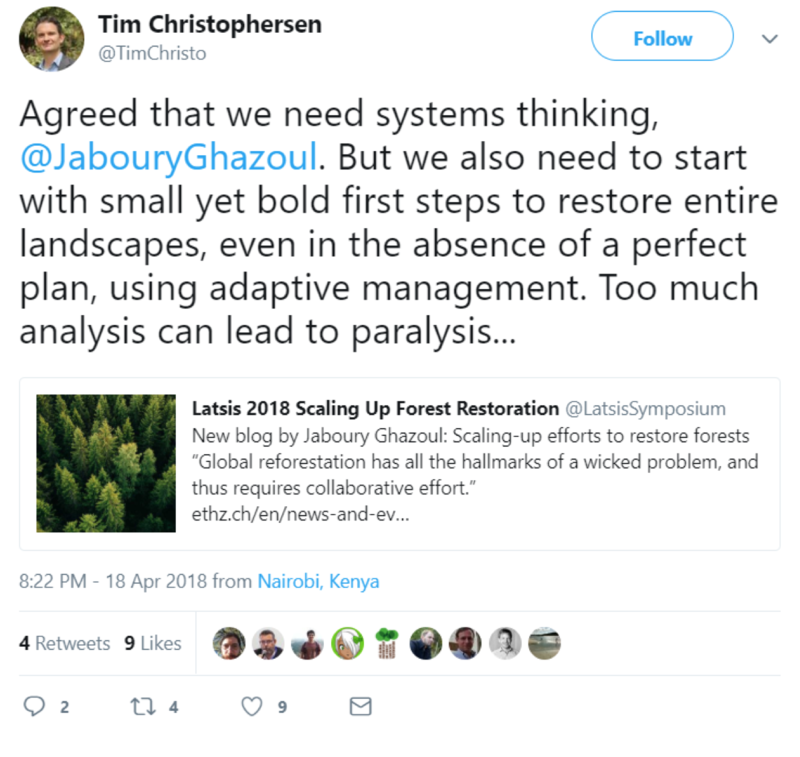 Many believe that too much analysis about the FLR process can lead to paralysis, as expressed by Tim Christophersen, Chair of the Global Partnership on Forest and Landscape Restoration, in a recent tweet in response to a blog post by Jaboury Gazoul which calls for a complex adaptive systems thinking approach in order to be able to scale-up existing scattered restoration initiatives. “The visions of how landscapes could look like before and after FLR will vary a lot across these scenarios. In order to make the framework useful, this is a kind of complexity we need to build in,” added Chazdon. A unifying FLR operational framework that embraces this complexity and that is flexible at the same time could be a very valuable tool. The framework could consist on a set of minimal benchmarks that should be fulfilled in order to meet the FLR principles, a common quality baseline. To describe this, Chazdon used an analogy we can all relate to: bathroom standards. “Bathroom standards are different around the world. Some bathrooms can be very sophisticated and have music and toilets with heated seats and a drier. Others might have a squat toilet. Some might have soap and towel paper and others might not. But there are some minimum requirements everyone agrees upon. Without such minimum bathroom standards we would have a lot of problems, such as contamination and disease. The core issue is that safeguards and quality are relevant and should be taken into consideration” she explained. Governments have voluntarily committed to restoring land following the FLR approach. Thus, a FLR operational framework and related quality standards could and should not be enforced. They should not be seen exclusively as a reporting tool either. Instead, they could be used as a tool to know how to implement and conduct FLR, a tool for self-assessment and improvement. A tool For the Love of Restoration. Automating forest restoration: could robots revive rainforests?